The Balanced Scorecard translates a company's vision and strategy into a coherent set of performance measures. The four perspectives of the scorecard--financial measures, customer knowledge, internal business processes, and learning and growth--offer a balance between short-term and long-term objectives, between outcomes desired and performance drivers of those outcomes, and between hard objective measures and softer, more subjective measures. 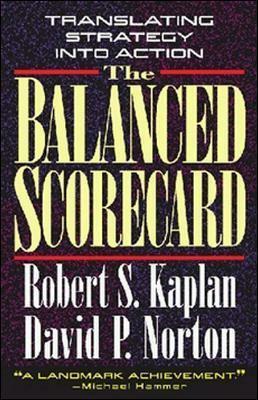 In the first part, Kaplan and Norton provide the theoretical foundations for the Balanced Scorecard; in the second part, they describe the steps organizations must take to build their own Scorecards; and, finally, they discuss how the Balanced Scorecard can be used as a driver of change. Illustrations note Mit Abb. u. Tab. Here is the book - by the recognized architects of the Balanced Scorecard - that shows how managers can use this revolutionary tool to mobilize their people to fulfill the company's mission. More than just a measurement system, the Balanced Scorecard is a management system that can channel the energies, abilities, and specific knowledge held by people throughout the organization toward achieving long-term strategic goals. Kaplan and Norton demonstrate how senior executives in industries such as banking, oil, insurance, and retailing are using the Balanced Scorecard both to guide current performance and to target future performance. They show how to use measures in four categories - financial performance, customer knowledge, internal business processes, and learning and growth - to align individual, organizational, and cross-departmental initiatives and to identify entirely new processes for meeting customer and shareholder objectives. The authors also reveal how to use the Balanced Scorecard as a robust learning system for testing, gaining feedback on, and updating the organization's strategy. Finally, they walk through the steps that managers in any company can use to build their own Balanced Scorecard. The Balanced Scorecard provides the management system for companies to invest in the long term - in customers, in employees, in new product development, and in systems - rather than managing the bottom line to pump up short-term earnings. It will change the way you measure and manage your business. Robert S. Kaplan is the Arthur Lowes Dickinson Professor of Accounting at the Harvard Business School. David P. Norton is the president of Renaissance Solutions, Inc. They are the authors of three seminal Harvard Business Review articles on the Balanced Scorecard.